Haruhiko Kuroda and Stephen Poloz speak, rate decision in Canada, New Zealand and the Eurozone and Employment data in the US and Canada. These are the main events on Forex calendar. Haruhiko Kuroda speaks: Monday, 15:40. BOE Governor Haruhiko Kuroda speaks in Tokyo. Last week Kuroda said the central bank is not seeing another rate cut after introducing a negative rate in February. The effects of the new monetary policy are starting to show and will help the BOJ to achieve its 2% inflation goal approximately in the first half of 2017. Since the BOJ’s rate cut in January, some banks started cutting mortgage rates while also reducing deposit rates. Market volatility is expected. Canadian rate decision: Wednesday, 15:00. The Bank of Canada maintained its interest rate at 0.5% in January, judging that the current stance of monetary policy is appropriate. The central bank cut rates twice in 2015 in order to boost the economy. Analysts do not rule out another cut this month, although the bank may not be in a hurry to cut rates before the federal budget is released. The BoC expects Canada’s economy to expand by 1.5% this year and 2.5% in 2017. US Crude Oil Inventories: Wednesday, 15:30. US crude inventories edged up by 10.4 million barrels to a record high 518 million last week. The reading almost tripled the 3.6 million-barrel increase projected by analysts. Oil prices declined on the data but recuperated modestly higher from Tuesday’s settlement. Economists expect prices to rise gradually over the course of the year. Investors expect prices will rise hoping OPEC will convince its members to cut production. New Zealand rate decision: Wednesday, 20:30. The Reserve Bank of New Zealand decided to keep its key interest rate unchanged at 2.5% in January, after December’s rate cut. The decision was in line with market forecast. Concerns about global economic strength in China and emerging markets downgraded inflation expectations. Furthermore, domestic economy weakened during the first half of 2015 driven by the lower terms of trade. However, growth is expected to rise in 2016 amid strong net immigration, tourism, a solid pipeline of construction activity, and the lift in business and consumer confidence. Eurozone rate decision: Thursday. 12:45. European Central Bank President Mario Draghi signaled the bank may ease its monetary policy further in March amid rising concerns over the weakening of global economic growth causing volatility in financial markets. Draghi said the measures the bank announced in December were drastic but circumstances had changed since then and that there was “no limit” to action within its mandate. The slide in oil prices the weakening in China and commodity prices will keep the ECB busy in the coming months. US Unemployment Claims: Thursday, 13:30. The number of US Jobless claims unexpectedly increased by 6000 claims last week, reaching 278,000. Analysts forecasted claims will increase by 271,000 last week. However, the underlying trend remains robust. The four-week moving average of claims dropped 1,750 to 270,250 last week, the lowest level since late November. The claims report showed the number of people still receiving benefits after an initial week of aid rose 3,000 to 2.26 million. Analysts expect the number of new claims will reach 272,000 this week. Stephen Poloz speaks: Thursday, 21:15 BOC Governor Stephen Poloz will speak in Ottawa. Stephen Poloz, said in January that there is no simple solution to the oil price plunge and the continuing collapse in commodity prices. The economy will heal itself but it will be a painful process which will weigh on Canadians, despite the BOC easing measures that can help buffer those effects. Poloz expects the Lonnie to remain weak exactly as it had been in early 2002 when oil prices plunged to around US$25 per barrel. US Prelim UoM Consumer Sentiment: Friday, 15:00. Consumer sentiment dropped in February to a four-month low of 90.7 after posting 92.3 in January amid declines in stock prices and weaker global conditions. The current conditions section fell to a three-month low of 105.8 from 106.4 Nonetheless, there was a 45% increase in the number of households reporting that their financial situation had improved. The six months gauge declined to 81, the weakest since September, from 82.7. Bear market rally was started in the beginning of the January this year - price broke 100 period SMA together with key resistance levels. Fibo resistance level at 1279.71 was tested the rice to above for the market rally to be continuing. Ascending triangle pattern was formed the price to be broken to above for the local uptrend as the bear market rally. If the price breaks Fibo resistance level at 1279.71 so we may see the local uptrend as the secondary market rally within the primary bearish market condition. 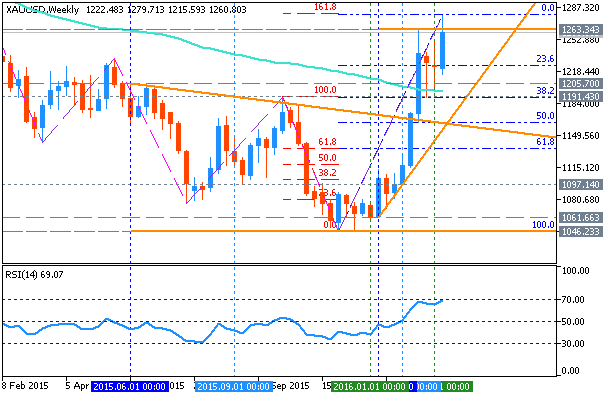 If the price breaks Fibo support level at 1061.28 so the primary bearish trend will be continuing. Last edited by mql5; 03-06-2016 at 01:35 PM. M15 price is located below SMA with period 100 (100-SMA) and SMA with the period 200 (200-SMA) for the primary bearish market condition: price is testing 1.3260 resistance level to above for the secon dary rally to be started. If the price will break 1.3311 resistance level on close M15 bar so the reversal of the price movement from the primary bearish to the primary bullish market condition will be started. 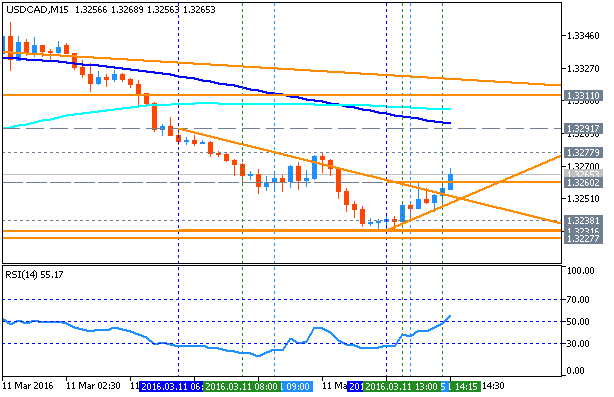 If price will break 1.3227 support on close M15 bar so the bearish trend will be continuing.